Put this script into your Max stdplugs\stdscripts and restart the Max. The Garbage Collection don't like this modifier. Recommended to collapse the modifier stack and restart the Max. Such scripted modifiers are memory consumer and I prefer to omit any callbacks additions which might polish some behaviours but will make the whole solution more dirty. 1. The size of modified object is acquired once when the Dimension is added to it. And that mean any size's changes of the base object after that are not handled. Shortly, if you need to modify the base object, just temporality remove/cut the Dimension modifier and then you are done, turn/past it back on the stack. 2. When you apply the modifier as instance to many objects of varied size, and wish to work in Absolute mode, keep in mind that the XYZ values you see are the size of the first object (to which the modifier is applied to). I hope this not look too logical confusing. 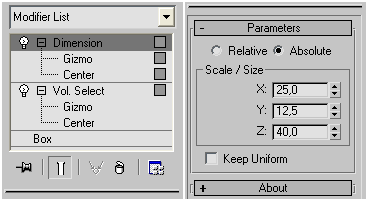 Submitted by janci on Fri, 2015-07-31 11:19.
i agree with others who commented, as a dimension plugin it should be primarly showing absolute dimensions, and rather than changing the dimension to a fixed number, it should show the current dimensions and let the user change them as needed. Submitted by rs3d on Fri, 2014-10-24 02:41. Submitted by DavidAnatolie on Sun, 2014-08-10 20:28. Excellent script, works very fine. Submitted by mustafa mamdouh on Sun, 2014-02-09 05:02. Hope you have some time to develop it more .. Submitted by dsp_418 on Fri, 2014-01-03 00:31.
apologies, I totally forgot about this post! Maybe there's an email notification system here on script spot, if so I've to turn it on somehow. 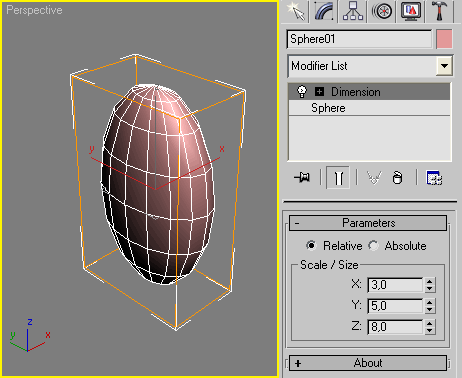 Anyway, don't drop the script in the viewport, copy it in the scripts/Startup folder in your 3ds Max program folder. Submitted by Dom on Wed, 2013-08-07 13:09. Nothing happens when I select the modifier, it's not in the stack. but when I select it, nothing happens and the modifier do not appear in the stack-list. Submitted by dsp_418 on Wed, 2013-08-07 10:10. It works just fine here. It works just fine here. What's the issue? Submitted by Dom on Wed, 2013-08-07 06:40. Very usefull script, but not working in Max 2014, can you have a look ? Submitted by Anubis on Tue, 2012-08-28 14:19. Submitted by headd on Tue, 2012-08-28 02:27. Could you add the possibility to scale to system units. I mean that the modifier read the actual object bounding box size, and then you can modify further.